Most people do not consider science a dangerous profession. However, laboratory accidents sometimes occur, especially when employees are working with volatile chemicals. Accidents may be the result of carelessness. Some common types of injuries include chemical burns, cuts from broken glass, inhalation of toxic fumes, absorption of chemicals through the skin, and ingestion of toxic chemicals. These can result in minor or serious harm to employees. If you are hurt in a scientific job, you should consult an experienced Boston laboratory accident lawyer at Pulgini & Norton. We can assist you in the process of seeking benefits, using the knowledge, skill, and resources accumulated from our substantial experience as workers’ compensation attorneys. Eye injuries may be the most common form of harm in a lab accident. Sometimes these injuries are due to a failure to wear protective eyewear, while other times they are a result of failing to use eyewash appropriately. Cuts and burns are also common. Failing to take appropriate precautions can result in serious injuries that require hospitalization and sometimes result in permanent disability. 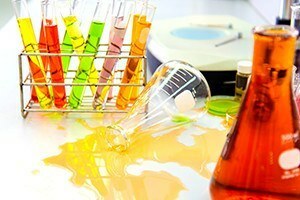 In some cases, investigators may have difficulty determining the cause of a laboratory accident. However, the Massachusetts workers' compensation system is designed to provide financial relief to injured employees without regard to fault. You are entitled to medical benefits and other benefits if you have a work-related injury. Unlike in a personal injury lawsuit, you will not need to prove that any entity or person was negligent in causing the accident. You also will not lose any benefits if you were to blame for the accident, unless the injury arose out of your serious, willful misconduct. Particularly in the case of severe injuries, you may face immediate and pressing financial concerns. You should immediately seek medical attention and provide notice to your employer so that the employer can give notice to its workers' compensation insurer. Medical records can be helpful in establishing the basis for your claim. Many different types of benefits may be available through a workers' compensation claim. If, for example, you suffer serious eye injuries, and your eyesight is crucial for your job, you may be eligible for permanent disability and loss of function benefits. Permanent disability benefits do not cover all the income you lose. They are based on two-thirds of your maximum average weekly wage, calculated by averaging all of your income in the 52 weeks before the lab accident, including overtime, bonuses, earnings from second or third jobs, certain fringe benefits, adequate medical care for disability, and reimbursement for medical mileage and parking and prescription medications. The amount is adjusted annually to consider increases in the cost of living. You can also receive a one-time payment for loss of function in your eyes. This benefit is paid on top of other payments like medical bills and lost income. The amount paid will depend on the severity of the loss of function. At Pulgini & Norton, our Boston laboratory accident attorneys can represent you if you suffer injuries as a result of an accident or illness on the job. You may be entitled to medical benefits, disability benefits, and loss of function benefits. We also advise and represent injured employees in Cambridge, Medford, Lowell, and other cities in Massachusetts. Call us at 781-843-2200 or contact us via our online form for a free consultation with a workplace accident attorney.